The 12 oz. RTIC Coffee Cup is stainless steel, double wall vacuum insulated. Keeps your drink hotter for longer and maintains a comfortable temperature to hold thanks to the double wall design. This is an adult sized mug for the home, office, camping, hiking and RV and fits under all popular coffee makers. The included all-new shaded splash proof lid lets you know exactly how much drink you have. The flip-top closure resists spills. The extra wide mouth allows for easy cleaning. Double wall vacuum insulation - Maximum temperature retention & Insulates hands from the heat and cold. Designed to keep beverages cold for up to 24 hours and hot for 6 hours. Constructed from premium grade, 18/8 stainless steel that's non-toxic, non-leaching and BPA free. 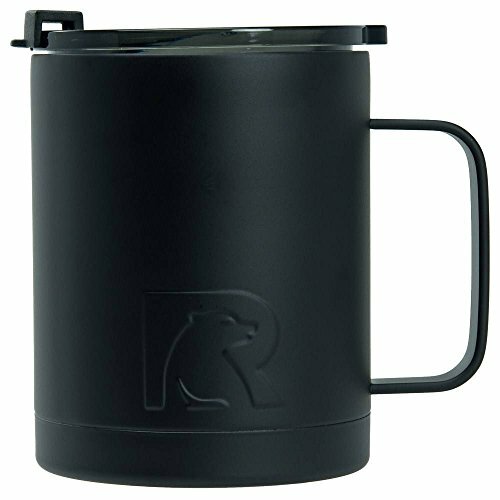 Built-in steel handle makes the RTIC Coffee Mug easy to carry. The included all-new shaded splash proof lid lets you know exactly how much drink you have and the flip-top closure resists spills. View More In Glassware & Drinkware.